The importance of music theory; it helps many musicians perform better and provides a window into the composer’s mind and intentions. The importance of music theory should be widely recognised. 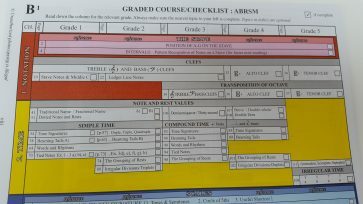 It is with good reason the ABRSM exam board say students must pass Grade 5 music theory exam before they can take grade 6, 7 or 8 practical exam on their chosen instrument. Yet most students do not study music theory in their instrumental lessons. 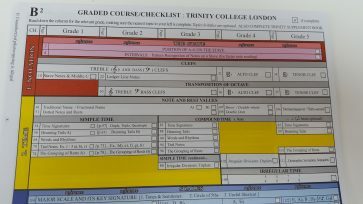 The result is a mad rush to prepare for Grade 5 music theory just a few months, even weeks, before the exam and many students are not prepared. Why is theory not taught earlier as part of the instrumental lesson? There are at least three reasons. The first reason is easy to understand; lack of time. There is already much to fit into an instrumental lesson; exercises, instrumental studies, pieces, aural training… The list goes on. Theory is too often tagged on at the end or forgotten altogether (until the exam date looms!). Secondly, there is a real fear from the teacher that they will bore their student if they open a theory book. After all, isn’t music theory boring? Many people assume that it is and sadly this attitude is found in teachers. The problem is that theory is taught by rote. Most teachers teach as they have been taught themselves and people are used to the old “jigsaw method”. Dry snippets of information are given bit by bit, in the hope that they will eventually piece together and make sense to the student. For many that day never comes! Also, thirdly, a few teachers worry that the parent may misunderstand if they devote more time to music theory. After all, isn’t the child being sent to an “instrumental” lesson? Will the mum or dad object if occasionally the instrument is put to one side and they spend half their time looking at a theory book? Obviously, it is hard, if not impossible for a musician to write a piece of music if they have little theoretical knowledge. Which time signature is best to use? How do you group the notes, rests and beam the tails accurately? How do you indicate your intentions? Basic knowledge is essential if the music is to be written clearly and legibly. Grade 5 theory also involves some knowledge about orchestral instruments in general. It is ludicrous to write a piece for clarinet which cannot be performed because the notes are either too high or too low for the instrument. It would be silly to write ‘accelerando’ (which means get gradually faster) when you in fact wish to tell the performer to slow down (‘rallentando’). The importance of music theory for composers should be obvious. Some musicians may object to any mention of the dreaded two words “music theory” and respond; “But I’m not a composer, why bother? Anyway, I learn theory whilst learning a piece of music”. That is true, to a certain extent, but the result is often mere surface knowledge. Yes, you may be told that 12/8 time signature means count four dotted crotchet beats in a bar or that the current piece you are learning is in B major, which has five sharps. But does that make sense? It has proven hard to remember rules presented in such an abstract fashion. But not only that; can you be satisfied with such meagre understanding? Don’t you wish to know why these particular numbers are chosen and the reason such rules and conventions exist? Too often the response is; “Music theory isn’t important, let’s just get on with playing the instrument!” But knowledge of music theory should be an essential ingredient in any music lesson since it can help a person to play better on their instrument. This statement should not be misunderstood. Of course some students, with a good ear, know instinctively how to phrase and shape a melody without much knowledge of music theory. However, for other students, this does not come naturally. For them, a little knowledge of the building blocks used to write a piece of music, whilst not guaranteeing a musical performance, can only be beneficial. Music theory, after all, is largely about how music works. All musicians (even non pianists!) should know a little about chord progressions and the direction/feeling produced by certain chords written in a particular order ( so called ‘harmonic progressions’). Certain chords naturally create the feeling of tension and relaxation which in turn dictates the way the melody is shaped. At the basic level, this knowledge is about cadences. For example, an ‘Interrupted Cadence’ (chords V-vi) creates the feeling of instability, whilst a ‘Perfect cadence’ (V-I) feels final and complete. Some chords are unusual for the period in which they are written; for example a ‘diminished chord’ in Classical music. It is good to be aware that the composer intended this chord for dramatic effects. Anyone would find it helpful to memorize a piece of music if they know about its structure and we should recognize brief but important pivot chords (that perhaps suggest a moment of hesitation in performance) which are responsible for changing the entire course of a piece of music and setting it off on a different emotional route. Musicians should desire to understand the music they play and learning music theory is part and parcel of achieving that goal. The importance of music theory should not be underestimated. It can provide a window through which we are able to understand the composer’s mind and intentions, enhance our appreciation of music and help many musicians feel more fully connected with the music they perform.